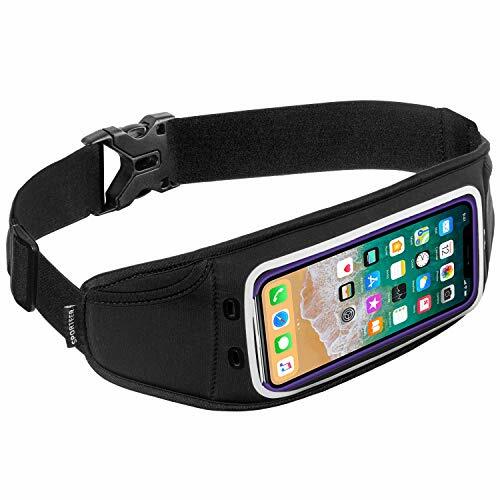 If you have small arms or just want to keep your arms free while running or working out with your phone, the Sporteer Zephyr Waist Pack is the ideal option. The Zephyr runner's waist pack fits all phones and cases up to 165mm x 85mm x 12mm including iPhone X, iPhone 8, iPhone 8 Plus, iPhone 7 Plus, Galaxy Note 9, Note 8, Galaxy S9 Plus, Galaxy S9, Galaxy S8 Plus, Galaxy S8, Galaxy S7 Edge, Moto G5S Plus, LG G6, V30, Nexus 6P, Pixel 2 XL, Pixel XL, Pixel 2, Moto Z2 Play, Xperia XZ Premium, Moto Z Force, Z Force Droid, Galaxy S6 Edge Plus, OnePlus 5, Moto G5S Plus, P10 Plus, Moto Z Droid, Galaxy S8 Active, LG V30, Moto G5 Plus, G5S, LG G5, LG G4, Moto X4, XPeria XZ2, and MANY more. The Zephyr is ultra-thin and lightweight but has plenty of room for your phone and cash, cards, ID, lip balm, or gel shots. A water resistant layer inside the pocket isolates your phone and protects it from sweat, moisture and scratches. And, you'll always have full access to your apps and screen controls through the touch-sensitive screen.. Sporteer is based in the USA and we back our products with a full 1-Year USA warranty and USA customer support. All Sporteer products are designed and extensively tested by athletes in the USA and we offer a 100% satisfaction guarantee on all Sporteer products. Please contact Sporteer Customer Service if you have questions about compatibility with your phone, case or battery pack. NOTE: The home button on iPhone 7 Plus, iPhone 7, iPhone 8 Plus, iPhone 8 cannot be activated through the touch screen. In order to open the screens on these devices, we recommend using AssistiveTouch. HOME BUTTON/ASSISTIVE TOUCH - Enable AssistiveTouch: Settings-General-Accessibility-AssistiveTouch-turn ON. Move black square/white dot icon along edge of screen. To use: Press unlock button on top right of the phone. Tap AssistiveTouch icon. Tap Home Button to enter your passcode to unlock screen. Once the screen is open, your phone will have full touch screen functionality. SWEAT RESISTANT ZIPPER AND INTERNAL MOISTURE BARRIER TO PROTECT YOUR PHONE: Your phone is secure and protected inside a water-resistant, zippered pocket. An internal liner provides additional sweat resistance and keeps your phone dry.